From: Commanding Officer, Special Expedition against Chipote. 1. At about 0930, January December 30, 1927, while marching on Quilali, this expedition encountered a bandit force of Sandino, estimated at 400 to 500 strong on the Camina [Camino] Real, about 1500 yards south of Quilali. The action continued on for about one hour and twenty minutes when the enemy was driven off. 2. 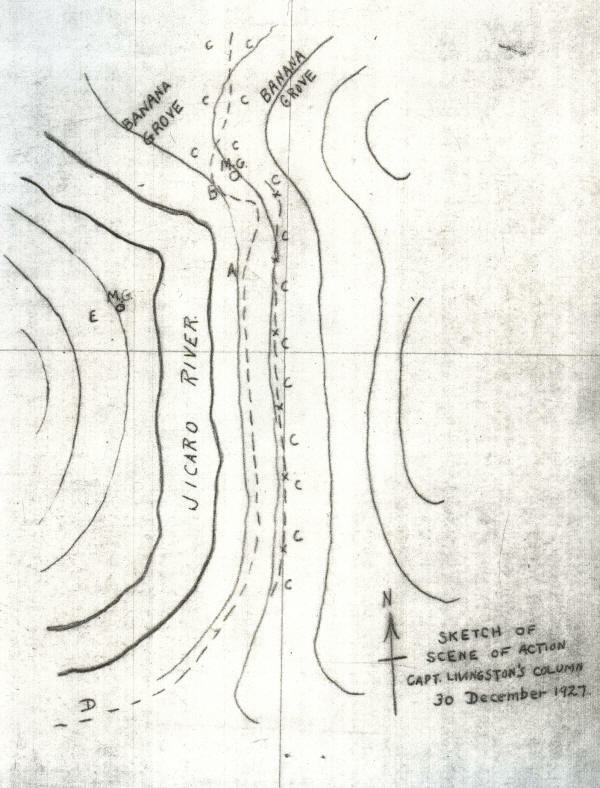 At the time the enemy force was encountered, this force was marching single file on a narrow trail along the side of a mountain with the Jicaro river on our left (west) flank. The mountain sloped at an angle of about 45 degrees and the slope from the trail to the river 100 feet below us was about the same. The river at this point was about 200 feet wide and made a sharp turn to the west, and side of the mountain, and a hill directly ahead flanking the trail at the bend was covered with woods and extremely heavy underbrush. A sketch, showing the general situation, not to scale, is enclosed. 4. (a) Bandit leaders unknown. (c) Aerial assistance - none of our planes were present during engagement but two planes arrived immediately after, strafed the hills in the direction given by us and departed. (c) MINOR WOUNDS - Fragments of bombs, etc. GOULD, Moses, J. 1st Lieut. Losses unknown, but believed to be heavy. (6) Medical Officer considers it necessary that all listed as seriously wounded be evacuated immediately because of lack of facilities for proper care. (7) Pack train badly shot up and scattered, report of losses of stores and animals will follow later. (8) No losses of ammunition or weapons known at present. Check up being made. (9) Check of ammunition expenditures being made. (11) Dead will be buried here. (12) Captain Livingston was wounded immediately after action started and the undersigned has assumed command pending arrival of Lieutenant Richal. See also Neill Macaulay, The Sandino Affair (Duke 1985), pp. 99-100. Sandino's account of the Fight at Trincheras, 30 December 1927.
. . . On last December 30, at eight in the morning, the enemy, made up of three hundred Yankees and two hundred patricides [Guardias], halted at a place called Trincheras, four kilometers from Quilalí, as if to conduct an exploration, and by slow degrees they maneuvered like some loathsome reptile, which couldn't be some any other way since they were not moving in a straight line. The liberators' irony was reflected in their gaze; their sarcastic smiles accentuated their expressions of hatred for the invaders; the firing sights of the famous "concones" searched eagerly for the hearts of the murderers of our sovereignty. With their feet firmly placed, the mortar operators waited for the enemy to bunch up so that they could exterminate them with the terrible explosions of their bombs. So it was that at five minutes past eight the chain of Yankee riflemen, made up of sixty men who advanced slowly against our trenches, was completely destroyed by a well-aimed discharge of our musketry, causing tremendous confusion and indescribable panic among the enemy, who in giddy flight trampled down everything in their way, the place we chose to defeat them being called El Paso de la Muerte. Those who miraculously escaped with their lives will remember that place forever. With the enormous number of casualties inflicted upon them over a period of five minutes, the enemy could not reorganize at the same point of combat to effect an orderly retreat. Instead, in total disarray they fled by different trails toward Quilalí, hoping to join another column of blond bandits who had left Telpaneca, aiding the advance of the seventh column of pirates who were defeated at Trincheras. With the violence of a thunderbolt and God's help, in five minutes freedom's defenders destroyed the battle plan that the punitive army had taken two months to prepare. Exploring the field we affirmed the results of our victory: sixty-four enemy dead, sixty-nine rifles and a Lewis machine gun, six thousand cartridges of various kinds, and many items of less importance. With our one-day march the enemy's advance in this sector was ended. . . . Source: Robert Edgar Conrad, Sandino, Testimony of a Nicaraguan Patriot (Princeton, 1990), pp. 151-52. • 80 minute battle on Camino Real just north of Quilalí; 5 Marines killed, 23 wounded; made the front page of the New York Times; prompted US President Hoover to announce he'd send 1,000 more troops to Nicaragua. A very consequential battle. • Launched just on the eve of the Sixth Pan-American Conference in Havana. • This "Special Expedition against Chipote" one of the few times in which Marines militarily weaker in the field than EDSN. • Sketch map of the action and Sandino's account of the fight included. • Should be read with other reports, incl. report on the Battle of Las Cruces (PC28.01.04b) and Kilcourse Diary (PC28.01.05).